Weihnachtsmarkt in Bonn: Germany is famous for its Christmas markets, where many people go in the evenings to meet friends, drink a warm mug of Glühwein (mulled wine), and shop for handcrafts, candied almonds (Mandeln), and Lebkuchen hearts. Decorating the Christmas tree (Tannenbaum) with lights, red and gold ornaments, and red candles (which may or may not get lit). Enjoying a big supper with some kind of roast meat (F’s family makes Sauerbraten, a beef roast pickled/marinated for seven days beforehand), bread dumplings (Semmelknödel), and lots of gravy-like sauce. What we call Christmas Day is called “the first Christmas (holi)day,” and 26 December (Boxing Day in the UK) is called “the second Christmas (holi)day.” Both days are free days in Germany, when families can relax and enjoy each other. We had delicious kohlrouladen (cabbage rolls) for lunch one day. They’re not unlike Ukrainian holubtsi, but the German version is only ground meat wrapped in cabbage, rather than rice + meat that Ukrainians use. We also went to watch the Bonn professional basketball team play. (Another!) 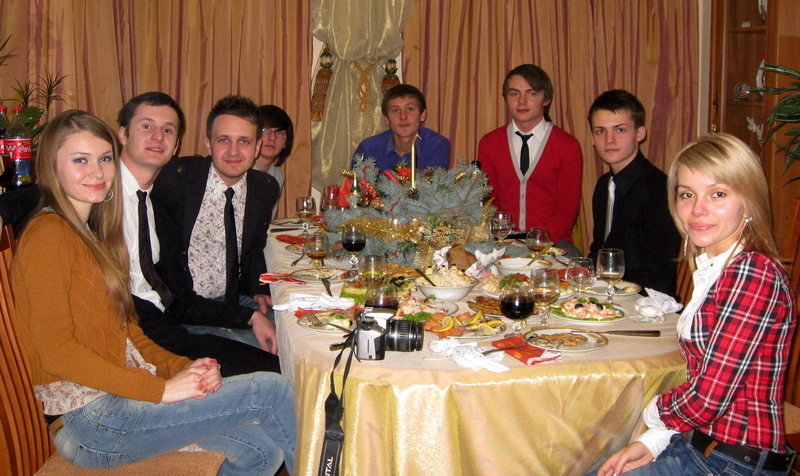 Christmas dinner with nine friends. Everyone contributed something, potluck-style. I made my mom’s sweet potato casserole and F made a delicious pot roast as the meal’s centerpiece. One evening, we enjoyed grünkohl (kale cooked for ages with sausages and pork, a typical dish in Westphalia) at F’s friend’s parents’. New Year’s Eve is traditionally celebrated with friends, like in many places all over the world. We gathered at F&M’s place for raclette and then fireworks (Feuerwerke). Interestingly, Germans are only allowed to buy fireworks for the couple of days leading up to New Year’s Eve. That means Silvester has tons of people setting off their own fireworks at midnight. We walked down to the Aasee and had a great view of ours and others’ fireworks around the lake. 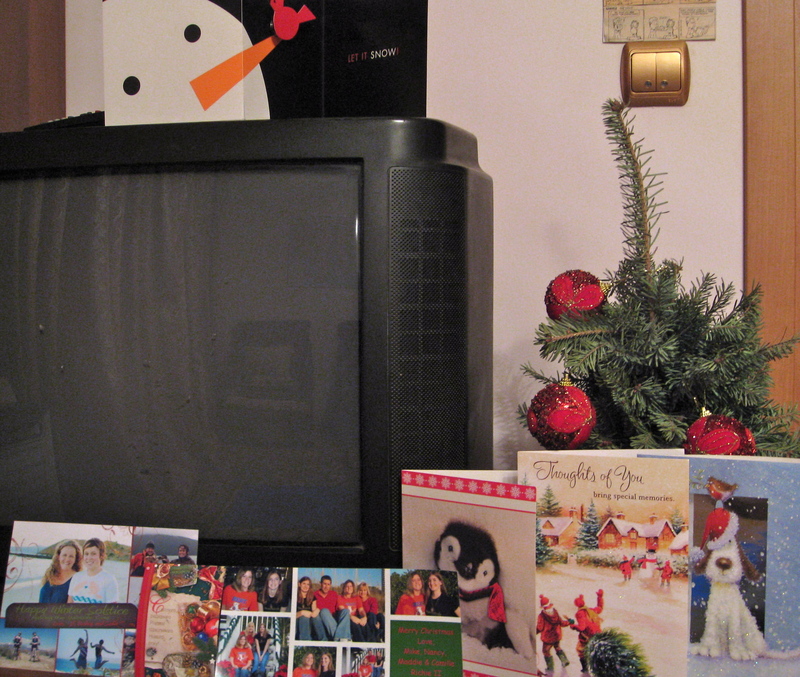 How does your family celebrate Christmas and/or New Year’s? This entry was posted in celebrations/holidays, community, culture, family, food, pictures, travel and tagged Christmas, Germany, New Year on 05.01.2014 by taplatt. This entry was posted in celebrations/holidays, education, Highlights, language, literacy, teaching, Things Ukrainians Write and tagged Christmas, New Year on 25.12.2011 by taplatt. 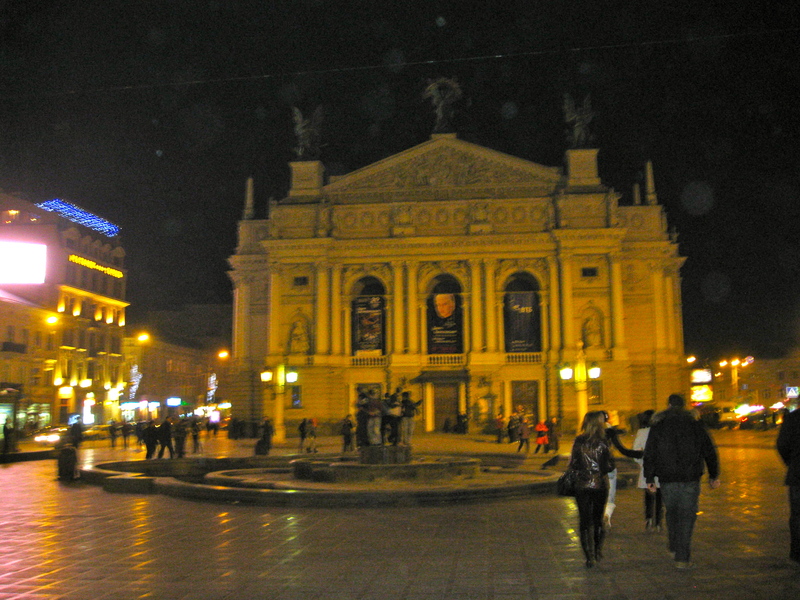 After Venice, my friends and I spent two days exploring L’viv, the unofficial capital of western Ukraine. L’viv has a rich history; the city was tossed between Poland, Austro-Hungary/Germany, and Russia before Ukrainian independence. One place this is apparent is in the city’s many names from all these different languages: L’viv (Ukrainian), L’vov (Russian), Lwow (Poland), Lemberg (German), and even Leopolis (Latin). Before World War II there was a large Jewish population; unfortunately, you can probably guess what happened during the War. One of the main highlights of two days in L’viv was having a cluster reunion – all five of us who trained together last fall met up for a morning of clock tower-climbing and lunching. 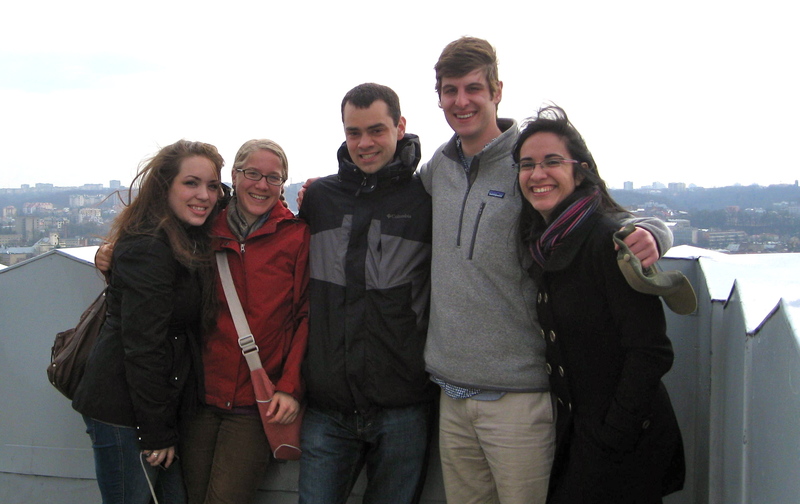 It was great, after traveling in Venice with Kate and Andy, to add Janira and Andrew back to the group. The clock tower – and Високий Замок (“vysokyy zamok,” literally “tall castle”), a hill with castle remains which Andy and I climbed – offered great views of the city. Not surprisingly, we also saw many more churches and just enjoyed walking around the city center. The culinary highlight of the city came at a Jewish-themed restaurant called “Pid Zolotoju Rozoju” (“under the golden rose”), where another PCV had told me you bargain for your meal price. Bargain, indeed – after an incredible lunch of spreads for matzo, fresh salads, tender chicken with cranberry sauce and gnocchi, and delicious spiced wine – the waiter started at 1,000 UAH for the four of us (aii! Not on our PC budget). We were able to get him down to a reasonable-but-still-expensive 400 UAH. 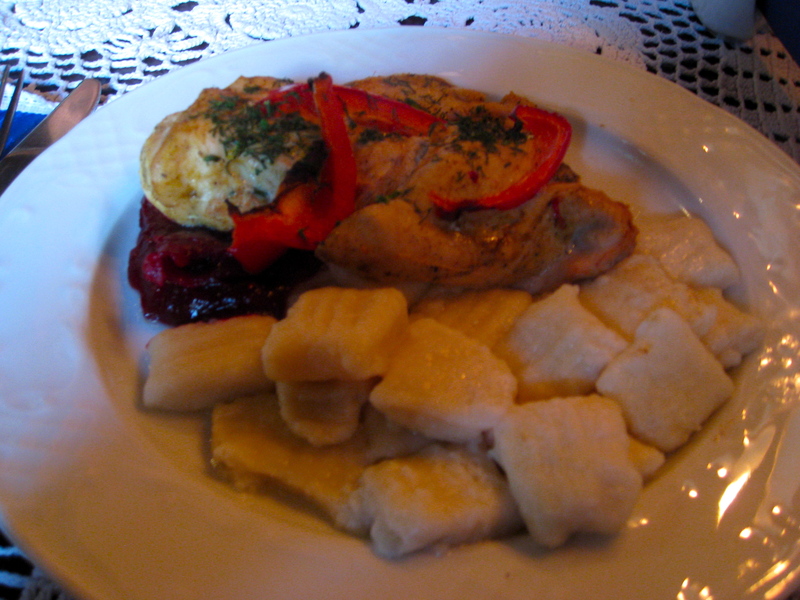 It was the most expensive meal I’ve had in Ukraine, but also one of the best. When I go back to L’viv I want to take advantage of the 25 UAH opera tickets — the opera house is beautiful from the outside, and they have lots of shows every day of the week. This entry was posted in culture, food, geography, history, language, pictures, travel and tagged New Year on 29.03.2011 by taplatt. Factoid of the month: Ukrainians love to celebrate. I’ve learned that if I’m invited to a Ukrainian party, I must expect it to be no shorter than four hours long. Takes endurance! 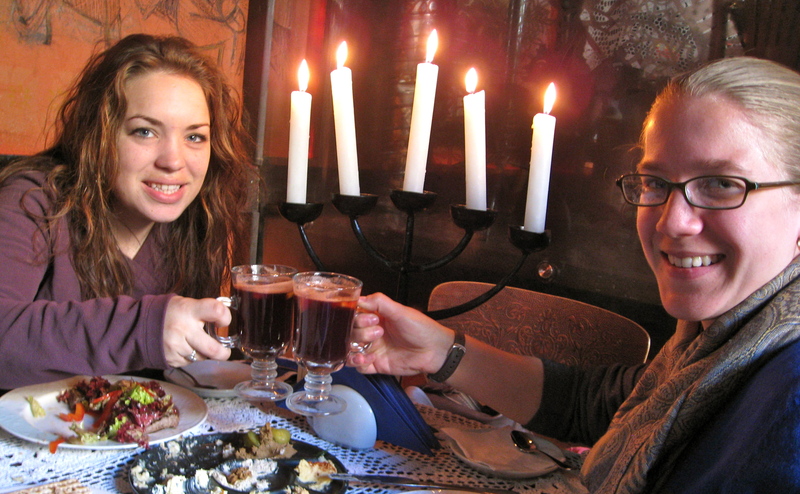 That said, I will lead you on a short narrative tour of how Ukrainians spend the end of December. New Year’s is a big holiday here. It’s like a cross between our (I guess Christian) Christmas and Halloween. During the last week of December at school, all the classes have New Year’s parties, and some perform little plays/fairy tales. New Year’s is when Ukrainians erect a tree (the “New Year’s Tree,” see the picture of my town’s central tree in a recent post), decorate it, and sometimes put presents under it. 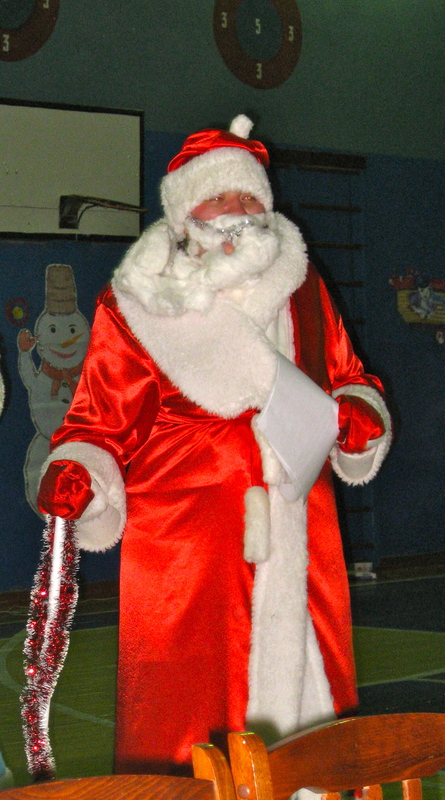 New Year’s is also when the Santa equivalent, Дідь Мороз (“didt moroz” = “Father Frost”), and his granddaughter Снігурочка (“snihurochka” = “Snow Maiden”) appear in their festive costumes. I saw three Дідь Мороз and Снігурочка during the week before New Year’s: at the Methodological Cabinet party, at the 5th Form’s fairy tale performance, and at the teachers’ New Year’s party at my school. I celebrated New Year’s Eve itself with my counterpart, her husband, and some of their cousins and friends — it’s fun because we’re all in our 20s. It was a low-key celebration, though I was up until 4:40am because we didn’t start celebrating until 11pm! January 7th is Ukrainian (Orthodox) Christmas (Різдво). 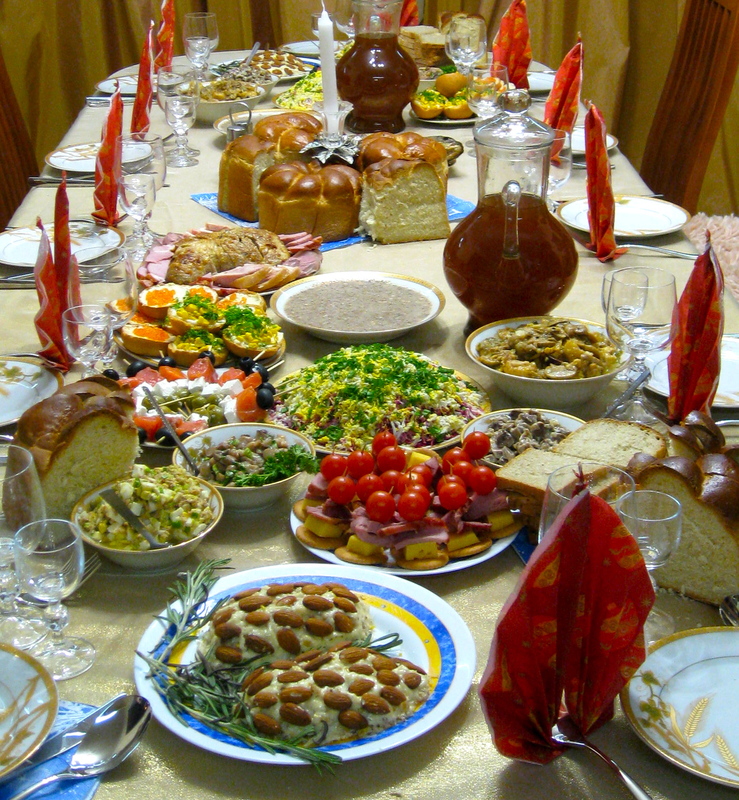 On Jan 6th there is a big feast — traditionally, a “holy supper” of 12 lenten dishes. I was lucky enough to be invited to my counterpart’s house for the Christmas Eve feast, where I joined her family, husband, a few grandparents, and aunts/uncles/cousins who appeared later. My counterpart’s family isn’t so strict with the food, but she says in villages the people stick to the customs more. 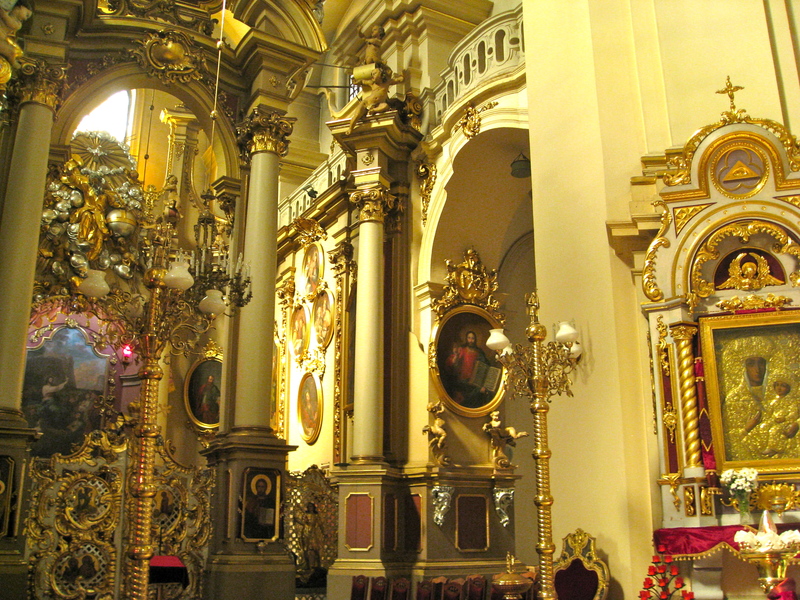 You can read about the traditional Ukrainian Christmas here. We did have a few of the traditional dishes: вареники (“varenyky,” stuffed dumplings I’ve talked about before), голубці (“holubtsi,” stuffed cabbage rolls which I really love), and кутя (a sort of porridge of wheat, honey, poppy seeds, and nuts, which we had to eat before anything else). The evening was great fun, and I got to practice my Ukrainian, which has gotten a bit rusty since stopping 4-hour language lessons after training. At one point one of my counterpart’s uncles tried to give me a patronymic name. Here, everyone has a patronymic name, which is formed with the father’s first name and a gender-specific ending. It’s respectful to call anyone not a close friend or family member by their first name and patronymic. For example, all teachers go by their name and patronymic to their pupils (and colleagues, when in the presence of pupils). My counterpart is Галина Андріївна (Halyna Andriyivna), because her father’s name is Andriy. So this uncle asked me what my father’s name is: Terry, which in Ukrainian is Тарас (Taras). My first name is close to the Ukrainian name Таміла (Tameela), so he christened me Таміла Тарасівна (“Tameela Tarasivna”), and proceeded to just call me Тарасівна for the rest of the evening. Pretty hilarious. I start teaching next week, so more posts are coming your way! Thank you to everyone who sent me holiday cards — I’ve set them up by my little Christmas tree and smile every time I walk by. This entry was posted in celebrations/holidays, community, culture, food, pictures, religion and tagged Christmas, New Year on 07.01.2011 by taplatt.